the exhibition poster below is worth downloading for both the images it contains and the schedule of events it lists. 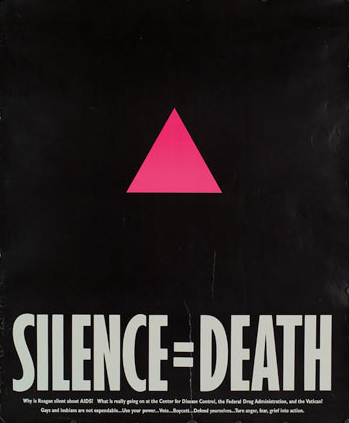 The Carpenter Center for the Visual Arts and the Harvard Art Museum present ACT UP New York: Activism, Art, and the AIDS Crisis, 1987–1993, an exhibition of over 70 politically-charged posters, stickers, and other visual media that emerged during a pivotal moment of AIDS activism in New York City. The exhibition chronicles New York’s AIDS Coalition to Unleash Power (ACT UP) through an examination of compelling graphics created by various artist collectives that populated the group. The exhibition also features the premiere of the ACT UP Oral History Project, a suite of over 100 video interviews with surviving members of ACT UP New York that offer a retrospective portal on a decisive moment in the history of the gay rights movement, 20th-century visual art, our nation’s discussion of universal healthcare, and the continuing HIV/AIDS epidemic. The exhibition opens just over 20 years after the formation of ACT UP and also marks the 40 year anniversary of the Stonewall riots, the defining event that marked the start of the gay rights movement in the United States. The exhibition ACT UP New York: Activism, Art, and the AIDS Crisis, 1987–1993 provides an opportunity to reinvigorate a debate around the realities of HIV/AIDS today, and about the links between visual art, political activism, health, and human rights.